In my article on Best Vacuums under $200, I shared some tips on how you could make the most of vacuums under $200. Most of my top five picks of best vacuums under $200 fell within the $100-$200 price category. To cater to those who are on a much tighter budget, I’ve decided to come up with another list of the best vacuums under $100. Your budget and needs should be your key considerations when deciding on the best vacuum that will suit your needs. 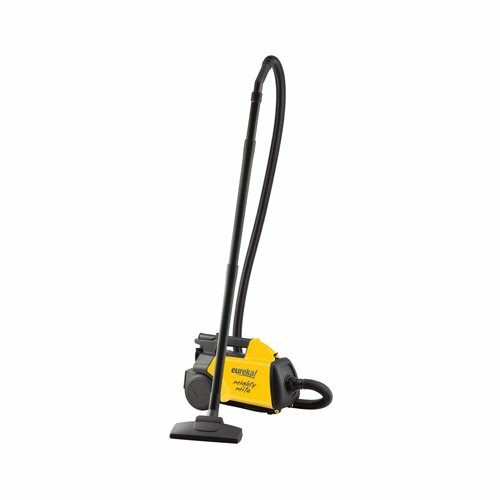 It is not impossible to get a good vacuum under $100. As mentioned in my article on Best Vacuums Under $200, you just need to recognize and accept that a lower-end vacuum will not come with all the fancy features of its more expensive peers. Base your decision on the features that will meet your cleaning needs. Avoid vacuums that come with features that you don’t need and you will realize it may not be that hard to find a good vacuum that is within your $100 budget for your house, pond or pool. Start your research by focusing on the top vacuum feature that is most important to you. Maybe you want a cordless vacuum to clean your car. Or maybe you want a corded vacuum that can do a decent job when it comes to cleaning up the house. Once you identify the most important feature to you, you will have an easier time determining the best vacuum under $100 to meet your needs. Of course, if you have special needs that cannot be ignored, you may realise that you simply cannot do without certain features which would cost more. For instance, if you or your family members suffer from asthma or allergies, then you may need to re-consider if the budget of $100 is a realistic one to begin with as vacuums equipped with HEPA filtration tend to be more expensive. As newer vacuum models flood the market, there are many opportunities for you to pick up a good deal by buying a slightly outdated but equally reliable vacuum model at a discount. You may be surprised to find vacuums priced under $100 with a few specialty features, albeit older versions of the newer models. If there is a good deal for more than one feature, I would recommend that you go for the added versatility for the price of one. For instance, one of my top picks here for the best corded stick vacuum under $100 can double up as a handheld vacuum when detached. So, if you are thinking of buying a handheld vacuum, you may want to consider the SD20000RED cordless stick vacuum, especially if the latter comes at a comparable price to the handheld vacuums you have shortlisted. While durability is usually a concern for cheaper vacuums, it is possible to pick the good apples from the bad ones if you invest the time and effort to assess the quality of the vacuum cleaners. Besides going for reputable vacuum manufacturers, you should also pay attention to the customer reviews. When reading customer reviews, it’s a good practice to check out the latest reviews just to see if they remain consistent with older ones. A highly-rated vacuum with a bout of bad reviews of late is not just a sign that the product had a defective batch recently; it may be indicative of a larger problem with the consistency of the company’s products that you may want to avoid. To help you out, I’ve summarized the best vacuums under $100 that are currently available. Similar to my approach in best vacuum under $200, I have provided a selection of different vacuums under $100 to cater to your different requirements when it comes to the best vacuum of your choice. I have introduced the Bissell 959A in my other article on Best Upright Vacuums 2017. Priced below $100, this is one of the best upright vacuums if you are looking for a low-cost but efficient vacuum cleaner. Even with other newer upright models in the market, this vacuum is still one of Amazon’s best sellers when it comes to upright vacuums. 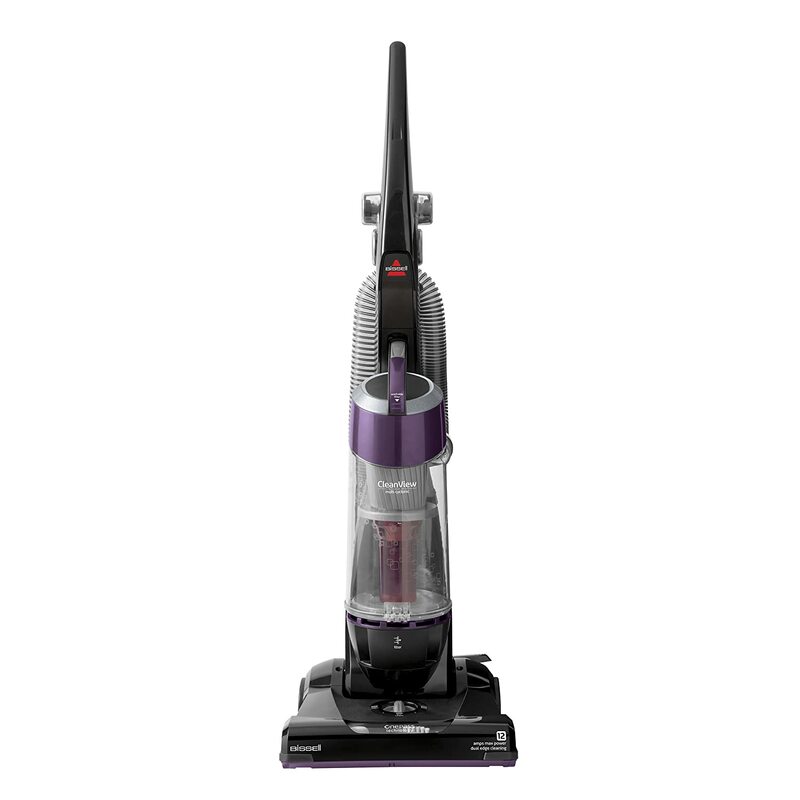 The Bissell 9595A is equipped with Bissell’s trademark multi-cyclonic system and OnePass technology which give the vacuum its powerful suction abilities. This includes its innovative brush design which provides a deeper cleaning on the vacuum’s first pass. At 15lbs, the Bissell 9595A is not exactly lightweight, but it’s not that heavy either. Its 13.5-inch cleaning path is also sufficiently wide to cover decent cleaning ground on each pass. It also comes with a 25-feet power cord which should be long enough for household usage. For a vacuum under $100, durability can be an issue. The Bissell 9595A does come with a two-year warranty, although it would seem from the reviews that it can break down after two years of usage. Nevertheless, all things considered, this still makes for a value purchase for a powerful vacuum cleaner while it lasts. If you want a cheap upright vacuum, I would recommend the Bissell 9595A as one of the best vacuums under $100. At 11.9lbs, the Eureka 3670G may be lightweight, but it is as the name suggests, “mighty” when it comes to vacuuming debris from bare floors, wood floors and tiles. This canister vacuum comes with a 12-amp motor, making it capable of powerful suction for a quick and efficient cleaning job. It also comes with a good array of vacuum tools: crevice tool, upholstery tool, dusting brush, carpet/bare floor nozzle and extension wands for cleaning areas that are higher up and harder to reach, like drapes and ceilings. The Eureka 3670G’s dust bag is also designed for easy disposal of the accumulated debris. This vacuum comes with a limited one-year warranty. The 20-feet long power cord is a little short but not a deal-breaker. While there are some customer complaints about the low quality of the vacuum hose, most customers are pretty satisfied with the Eureka 3670G. In fact, close to 80% of customers have given the Eureka 3670G good ratings, citing its strong suction power, lightweight and compact design and relative durability for its price. For a cheap canister vacuum option, I would say that the Eureka 3670G is one of the best vacuums under $100. ​Besides its striking red colour, the Dirt Devil Simpli-Stik SD20000RED is a statement purchase for a value SD20000RED buy under $100. This versatile vacuum can be used as a stick or converted into a handheld vacuum. At just 3.8lbs, this corded stick vacuum is amazingly lightweight yet compact in design—there’s even space to store the crevice tool on board. The SD20000RED is equipped with a 1.25-amp motor which delivers a decently consistent suction. It may not be as powerful as a standard upright vacuum, but it will do fine for basic cleaning tasks around the house. Although this vacuum does not come with a swiveling head, its two base wheels makes for easy navigation. It is also suitable for multi-surface cleaning when it comes to rugs and hard floors. The 16-feet power cord is slightly short but still manageable if you are not cleaning large areas with few power outlets. The SD20000RED comes with a one-year warranty. The Dirt Devil SD20000RED is definitely one of the best vacuums under $100 (under $50 in fact) for its convenient features and reasonable cleaning power. A cordless stick vacuum under $100 is unlikely to have the latest technology, but that doesn’t mean that it can’t get the job done. The Hoover Linx BH50010 may be one of the older Hoover cordless stick models, but it still offers good value for money. As with all Hoover vacuums, the Linx BH50010 comes with the company’s proprietary Wind Tunnel technology (albeit first-generation) that enables it to clear surface or deeply embedded dirt effectively. Other features include a 10lb lightweight design, a decent 11-inch cleaning path, edge cleaning bristles that give you better access to walls and corners, and a dirt cup that is designed for bottom release for mess-free cleaning without getting dirt on your hands. All these at a two-year warranty. That said, its 18-volt lithium ion battery is quite outdated and doesn’t last as long as Hoover’s newer models. 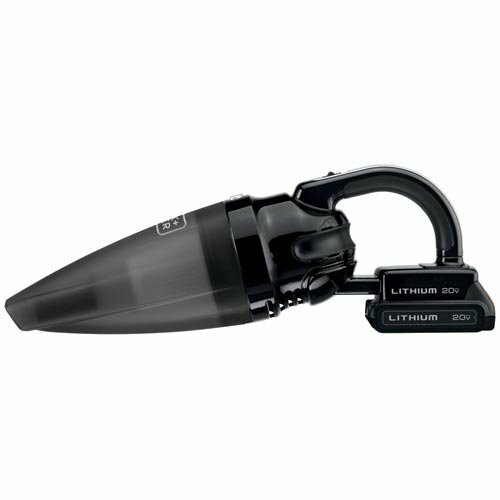 The Linx BH50010 also does not come with any other vacuum accessories. Nevertheless, for a frills-free cordless stick vacuum that does a decent cleaning job, the Hoover Linx BH50010 is one of the best choices if you have a tight budget below $100. For a handheld vacuum under $100, I would recommend the Black + Decker BDH2000SL. Its 20V lithium ion battery can last for about 15 to 20 minutes when fully charged and well-maintained. The BDH2000SL is an improved version of much older Black + Decker handheld vacuum models, boasting of stronger suction power, shorter charging time, higher energy efficiency and a ready light indicator for a fully-charged signal. These are new or improved features compared to older versions like the CHV1410L. It also comes with a crevice tool and a vacuum brush for vacuum accessories. The Black + Decker BDH2000SL has a translucent bagless dirt bowl which makes it easy for you to see when the bowl is full and needs to be emptied. This handheld vacuum comes with a three-year warranty. At just 4lbs, this handheld vacuum is a convenient cleaning tool if you need to carry it around the house or use it to clean your car. Although it is not Black + Decker’s latest cordless handheld model, this vacuum is a good choice to consider if you are looking for the best cordless handheld vacuum under $100. Getting a brand new but affordable vacuum cleaner need not be an uphill task. You just need to take a practical approach to identify your priorities and determine the vacuum that will best match your needs. Everyone loves a good deal and you can buy a great vacuum under $100 if you do your homework. Quality aside, budget-friendly vacuum cleaners can prove to be lasting if you take good care of it. Post-purchase upkeep and maintenance help ensure that your vacuum and the accompanying vacuum accessories stay in tip-top condition. It is important to follow the manufacturer’s instructions so that you can maximize the lifespan of your vacuum cleaner. For cordless vacuums, the batteries should be charged fully before usage and removed from charging once they are fully charged so as to preserve the battery lifespan. Be gentle when handling the vacuum and the vacuum tools, especially if you know that they are made from plastic or other materials that are not so durable and more prone to wear and tear. By keeping your vacuum and vacuum tools well-maintained, you may be surprised at how long these low-cost tools can last. I hope that you have found the above useful when it comes to hunting for the best vacuums under $100. If you are interested in specific vacuum types, you should check out my other vacuum articles on Best Backpack Vacuums, Best Commercial Vacuums and Best Upright Vacuums 2017. And for those who can afford a budget within $200, be sure to check out my other article on Best Vacuums Under $200 for more vacuum options.